transfronteriza is a women-led cultural organizing project focused on generating developmental spaces where women can lead and shape powerful ways to share their (or create new) stories. As a political and community-engaged artist, I want to create ways to continue to push my creative process to be radically integrated with my community organizing, and as I invited others to join me in creating this dance for the first time, the idea quickly grew to create a process that could support - through the activity of creating a performance together - spaces for collaboration, vulnerability and growth. The project is ongoing. The material for transfronteriza has been created with people, as young as 7 and as old as 70, and in spaces as varied as university classrooms, museums, women’s shelters, street art festivals, community centers, and public libraries. 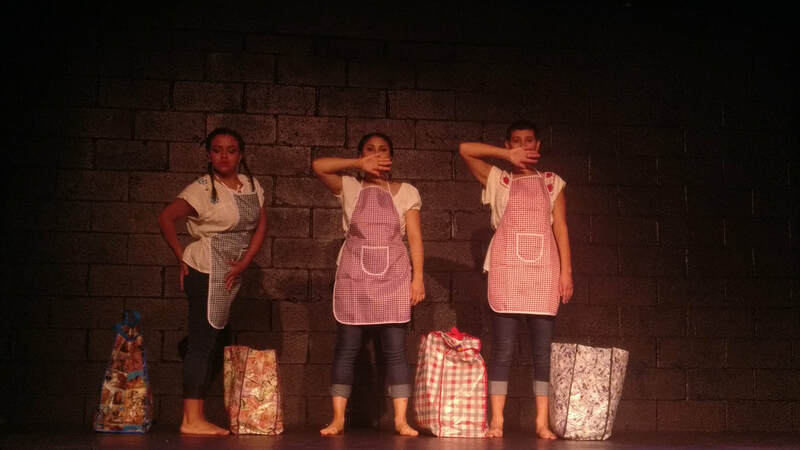 The original performance featured set design by Briseida Ochoa "Brioch," lighting design by Maria "Nita" Mendoza, original music and sound score by Chris Reyman, and movement, text, images and sounds from over 200 people from El Paso, TX and Ciudad Juarez, Chihuahua. We began by engaging, meeting and having conversations with women about their lives, perceptions, challenges, hopes and dreams specifically as it related to their lives on the border. To do this, we created a survey to guide these interactions and as part of this activity, we invited them to join us in creating transfronteriza with us. We are had conversations on the street, in women's shelters and with our families and friends. We also distributed the survey online in both English and Spanish to widen our reach. We estimate in this process we had reached over 100 women. 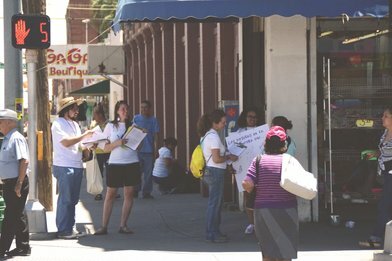 Volunteers from Boundless Across Borders having conversations with women on the street in El Paso, TX on June 3, 2017. The next step was organizing open community dialogues, workshops and rehearsals where we generated movement, sounds, images, and text that informed the shaping of the piece. 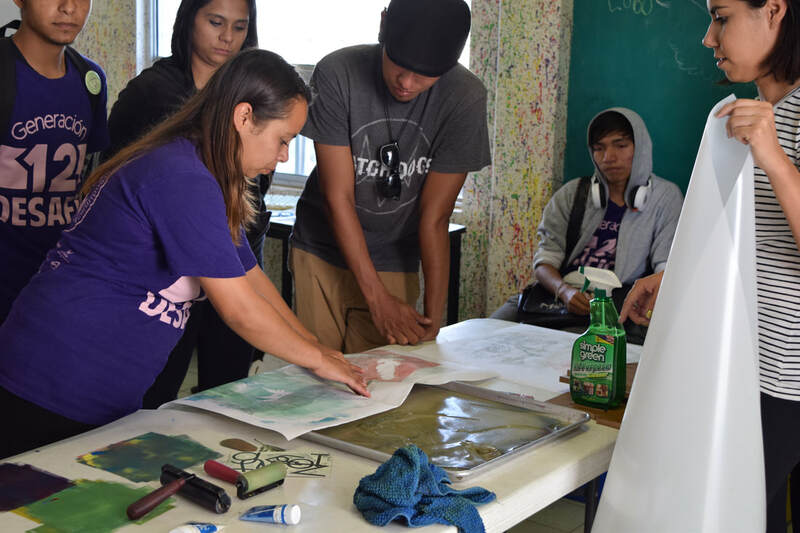 On June 24, 2017 we participated in one of the weekly-workshops The Cattleya Project offers at Sin Violencia AC - a women's shelter in Ciudad Juarez. The women interviewed and had conversations with each other about their lives, hopes, dreams and challenges as women on the border. We then workshopped some of their ideas and perceptions of women and created shapes and repetitive movements that we strung together into a short dance. From this workshop we developed the theme of luchadora. Sandra Paola generating movement with women in a shelter in Ciudad Juarez after having conversations about their lives on the border. On July 22, 2017, people gathered in the downtown public library in El Paso for our first public rehearsal and conversation. We moved, dialogued and brainstormed words from movement and movement from words, listened to sounds and music that have been in the works for our first performance and created a collective dance with all the material. A moving and powerful experience were 25 strangers came together to create something new. From this activity we generated the theme of seeds. 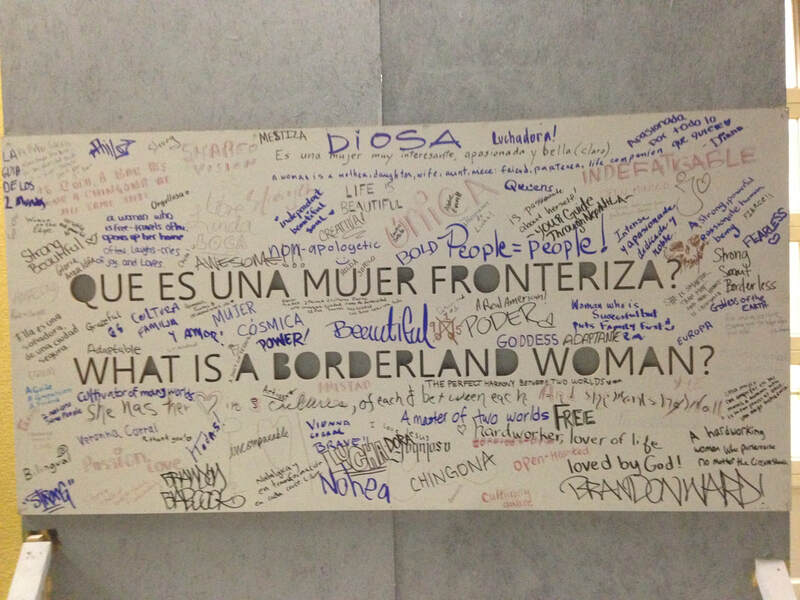 Wooden panel created with the answers from community members to the questions "What is a Borderland Woman?" On August 31, 2017, we stood on a sidewalk in downtown El Paso during the Last Thursdays Art Walk, inviting people to have conversations with us, create an interactive art piece (picture of the left) and contribute ideas to the development of movement for our first performance. The videos below were inspired by the dance collectively created on July 22nd (see above). From this we generated the theme of earth mother/goddess. On September 23, 2017 we teamed up with the Centennial Museum at the University of Texas at El Paso and developed our third public rehearsal and conversation in dialogue with their exhibit "La Frontera: A Century of Division and Resistance." We continued shaping the piece by creating text, recording parts of the soundscore and making part of the set. 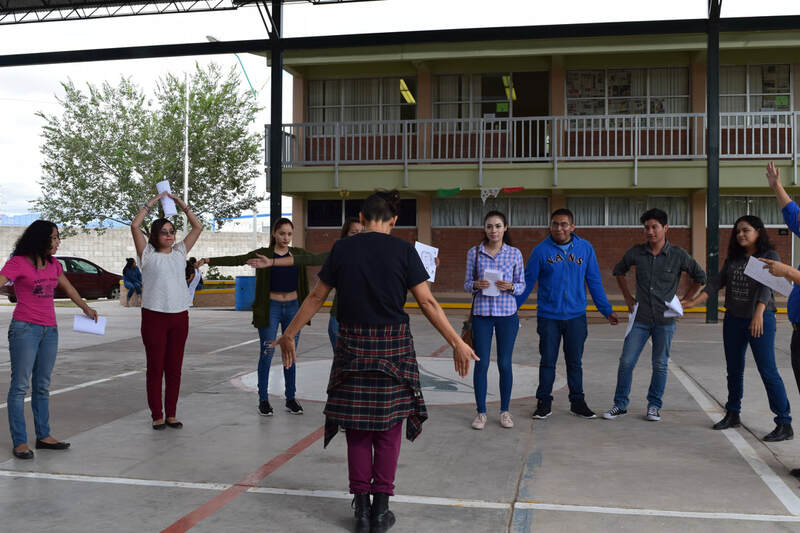 On September 29, 2017 we spent the morning with students at the National Pedagogical University in Ciudad Juarez (UPNECH) sharing two different processes that have been/are being used for the creation of the piece. Briseida Ochoa "Brioch" lead participants in a workshop of monotype printing where they designed and created images that she will put together as part of the set. On my part, I lead them through a drawing exploration about their experiences on the border and women in the border they admired. We then created short dances drawing from what each participant had drawn. The drawings will be shared in the SHIFT dance festival in Albuquerque during our first public performance and a public talk about our process. On September 30, 2017 we had our last public rehearsal in Ciudad Juarez at the organization Techo Comunitario. We worked with young people continuing to craft the set and recording parts of the sound score. We also had a dialogue with them about the importance of creating new things together and the impact it had on them to be invited to participate in the making of our first performance. The editing and putting together— and the generation of new materials for each dance continues to be done in relationship to collaborators and community members. So far, we've created an evening-length solo, a 30-minute multigenerational women piece, and 45-minute trio.